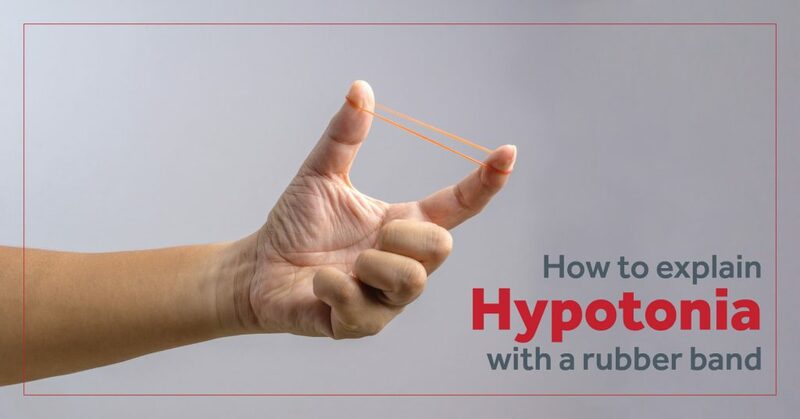 You’ve talked about hypotonia. It comes with the territory. Some people get it. Others don’t. Some people pretend to. Other think they do, but don’t. 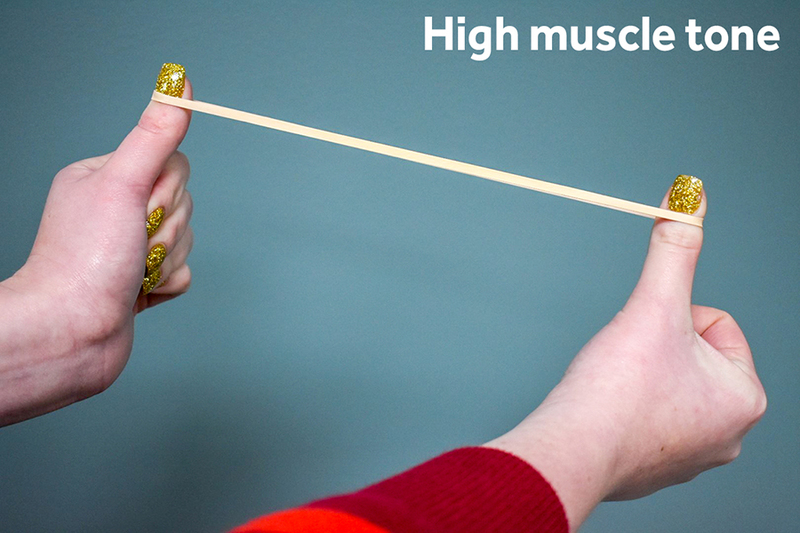 Next time that conversation pops up, here’s a simple, visual way you can describe muscle tone. Just grab a rubber band (or hair tie). 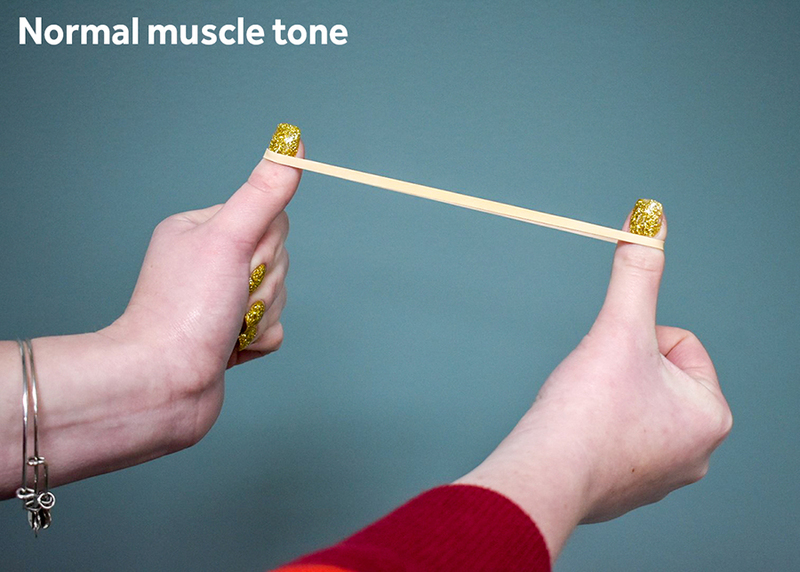 The rubber band represents the amount of tension in muscles while they’re at rest. Is this an oversimplification? Sure. But it communicates the basics. Muscles that are too relaxed or too rigid cause a variety of challenges. And they’re not all associated with mobility. Hypotonia can impact relatively simple things like breathing, swallowing, and grasping. Muscle tone is also a spectrum. No one, not even a world-class athlete, has perfect tone. It doesn’t exist. If you fall under the normal muscle tone category, you will still skew high or skew low. Muscle strength and muscle tone sound the same, but don’t get them confused. They’re different. A very strong child can still have hypotonia. And means just upping the exercise isn’t a surefire solution. Plenty of people think about hypotonia the same way they do about baby teeth. But low tone isn’t here today, gone tomorrow. It won’t fade away and it won’t vanish one morning. Kids carry it into adulthood. That’s why it’s vital to get treatment at a young age. Hypotonia is not an effort problem. It’s a physical, exhausting limitation. Can it be beaten? Absolutely. But the “just try harder” mantra isn’t always the best idea. Be patient. Take breaks. Consider accommodations.